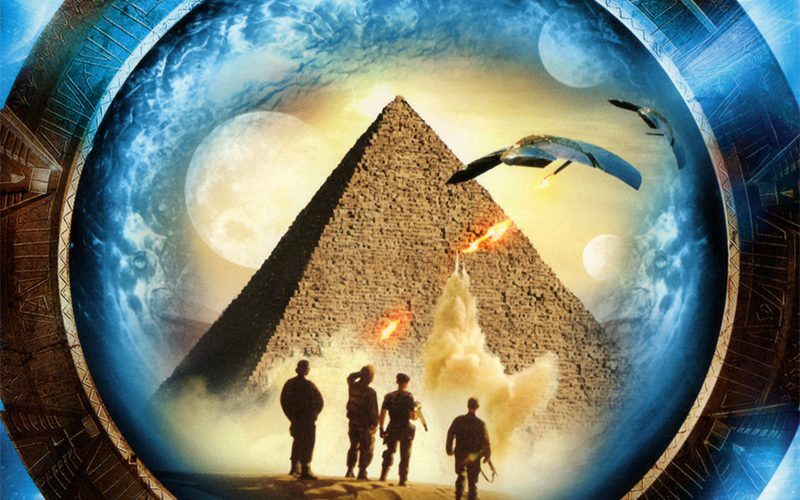 To understand what the movie Stargate was talking about when they said that a extraterrestrial was mining the Earth in the past one should review a few books about that subject. You nearly need a scorecard to keep all of the character straight so here is one. 1. The Anunnaki – a race of space beings who came to Earth to do mining of gold about 450,000 years ago. 2. Anu was the spaceman ruler of Nibiru and is the number 1 god of the Sumarian hierarchy of gods. 3. Sumerians and Akkadians were civilizations of Earth people. 4. Nibiru is the name of the 12th planet that comes close to the Earth at intervals of about every 3,600 years. It is also called Wormwood in the Bible. 5. Anu and his half sister were married and they had a son called Enlil. Enki was Anu’s first born son by another lady. So here is how it all happened a long time ago on this planet. Sitchin makes it clear that neither the Sumerians or the later Akkadians referred to these visitors to earth as “gods”. It was through the later paganism of Greece and Rome that the notion that they were divine beings, or gods, seeped into our language and thinking. The Sumerians called them DIN.GIR, or “the Righteous Ones of the Rocket Ships”. The Akkadians called them the Ilu, or the “Lofty Ones” (from which the biblical EI stems). Anu, the chief Anunnaki of “the twelfth planet”, Nibiru, left his son Enlil in charge of the affairs here on earth. Enki, who was a master scientist/engineer, was also given much power here on earth. Enki and Enlil were often involved in some sort of conflict with each other. This rivalry eventually included their own offspring and extended for millennia. Generally speaking, Enki almost always took the side of human in his conflicts with Enlil and other Anunnaki, Enlil, it seems did not much care for humans. The Anunnaki had been mining gold on earth for more than 100,000 years when the rank-in-file Anunnaki, who were doing the back-breaking work in the mines, mutinied about 300,00 years ago. Enlil, their commander-in-chief wanted to punish them severely and he called an Assembly of the Great Anunnaki, which included his father Anu. Anu was more sympathetic to the plight of the Anunnaki miners. He saw that the work of the mutineers was very hard and that their distress was considerable. He wondered out loud in this Assembly of the Great Anunnaki, if there wasn’t another way to obtain gold. At this point, Enki suggested that a Primitive Worker, an Adamu, be created that could take over the difficult work. Enki pointed out that a primitive humanoid (what we call Homo erectus, or a closely related humanoid) was quite prevalent in the Abzu (Africa) where he worked. Why don’t we “Bind upon it the image of the gods” in order to give it the intelligence and ability to carry out the mining. The Assemble of The Great Anunnaki liked this idea and approved it. Thus the decision to develop humans to work as slaves was made. Enki was put in charge of the creation of an Adamu, a primitive worker, that would assume the difficult work of mining for the Anunnaki. Enki was already located the AB:ZU, the land of th mines, which Sitchin believes was located in southern Africa where much gold has been mined in modern times. Sitchin quotes the journal of South Africa’s leading mining corporation, the Anglo-American Corporation, which state that many ancient mining shafts, with depths of up to fifty feet have been found. Three of these ancient shafts have been carbon 14 dated at 35,000, 46,000 and 60,000 B.C., and the archeologist hired to find these ancient mining shafts believe that mining was being done in southern Africa prior to 100,000 B.C. Of course, there is no evidence that stone-age humans could sink shafts into the earth in search of precious metals, and why would they ever want or need to mine gold? I will now attempt to give the information in abbreviated form that has been given in many books. It is not the total truth but is very close to what really happened. I don’t know what really happened or I would have told you……………………………………………..
Anu, the head spaceman who visited the Earth had a son called Enki and Enki had a sister called Ninti who took an egg or ovum into her body from a H. erectus female from Earth and fertilized it with the sperm of a young Anunnaki spaceman. Ninti herself was nicknamed Mammi the source of the universal Mamma/Mother. The baby that was produced by the action was called Adamu. This process was repeated many times by other “birth goddesses.” Sitchin’s book called “The Twelfth Planet” tells about this. The Bible story in Genesis about the making of Eve from a rib taken from Adam can be explained in the following way; The great Sumerologist, Samuel N. Kraimer, pointed out near the middle of this century that the tale of Eve’s origin from Adam’s rib probably stemmed from the double meaning of the Sumerian word TI, which means both “rib” and “life”. Sitchin points out that there are many other multiple meanings to many Sumerian words and an apparent penchant of the Sumerian scribes to play with these multiple meanings. Sitchin believes the Biblical tale of the creation of Eve represents a second genetic manipulation of the Adamu in order to make them fertile. Bone marrow, probably from a rib, was taken from a male Adamu, and implanted into a female in a genetic manipulation that is unknown to the modern genetic manipulators to allow the Adamu to procreate. The more procreation, the more slaves. And the slaves, the primitive workers, were in high demand by the Anunnaki. Early on, the new “primitive workers” were confined to the mining areas of the Abzu, Enki’s stronghold in Africa. But the Anunnaki from E.DIN (the abode of the righteous one”), which was located in the area of what later became Sumer, wanted “primitive workers” to do the manual labor for them. E.DIN was Enlil’s domain and contained a spaceport that shipped the gold to a permanent spacecraft that orbited the earth, and from thence the final transfer to their home planet was made. The tension between the two half-brothers, Enilil and Enki, heightened until Enlil led a raid on the Abzu and forcibly recovered a large number of Primitive Workers to E.DIN. JW You may notice E.DIN sounds a little like Eden.